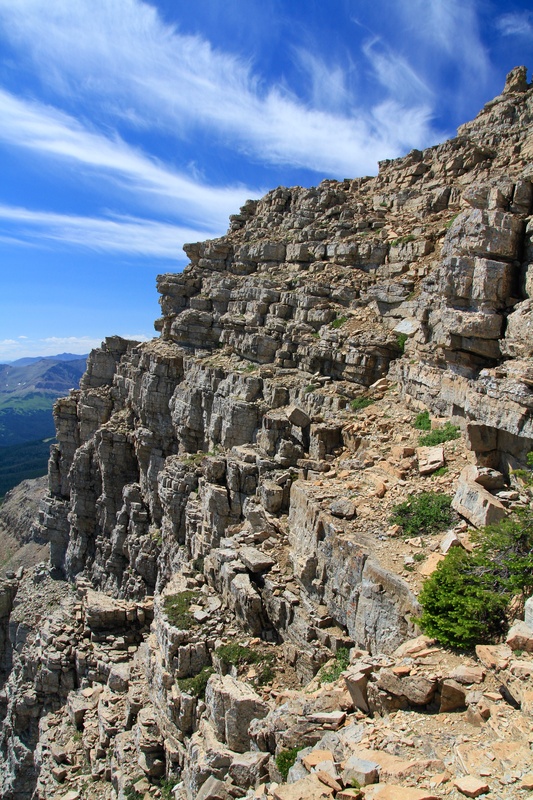 A short drive from Lethbridge (140 km), Divide Mountain (left) is a fun hike that can be done farily quickly. I forgot to bring my GPS so I don’t have any technical details, but I made it from my vehicle to the summit and back again in under 3 hours. I do know that the elevation at the summit is 2641m which makes for an impressive view westward from the summit. I got the idea for climbing Divide Mountain from Sonny Bou’s fantastic website. To get to Divide, drive to the town of St. Mary and travel approximately 10km south of town. Just before a U shaped bend in the highway at the top of the hill, turn into the roadside turnout on your right. You will see an access road which will take you to the base of the mountain. I’d recommend a high clearance vehicle as the road is quite rough. I took my Canon 7D along for the ride today. Usually I hike with my older Canon Rebel DSLR, but I thought I’d try something different. Here is a shot of Divide Mountain from the east. The ascent route follows the skyline north ridge from right to left. I gained access to the north ridge by going up along the vertical tree line that is pictured on the lower right hand side. 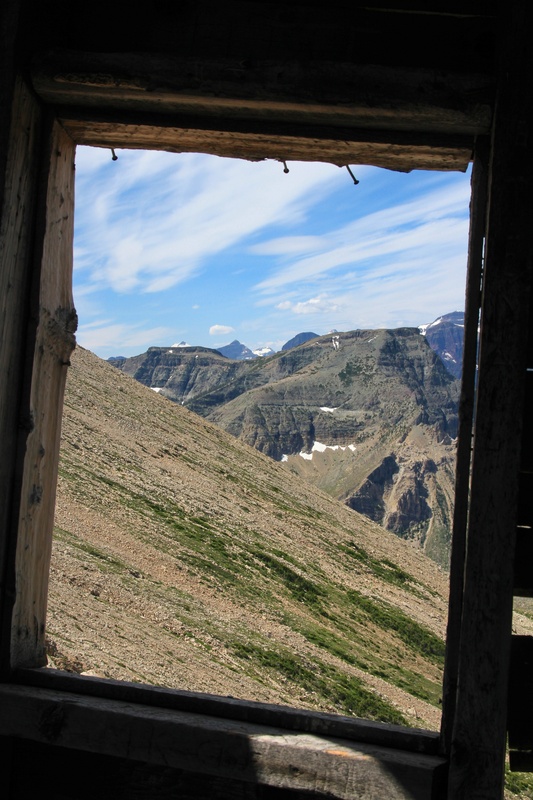 About a 1/3 of the way up Divide Mountain is an old firelookout that is perched precariously on the edge of a cliff. The summit lies in the distance behind the lookout. Looking west from inside the lookout. Looking up to the summit from inside the lookout. I thought that the wispy clouds made for an interesting visual effect. Another look a the old fire lookout as I set out for the summit. The views to the east are not as exciting, but the prairies do hold their beauty. It must have been some experience to ride out a thunderstorm while inside the lookout! The route I took to the summit followed the edge of the ridge (left). Looking back down the ridge at my ascent route. You can barely see the fire lookout. The little town of St. Mary sits between Upper and Lower St. Mary lakes. Once near the top, there are a few ways you can go. For fun, I scrambled up this rock band on Divide’s east face. 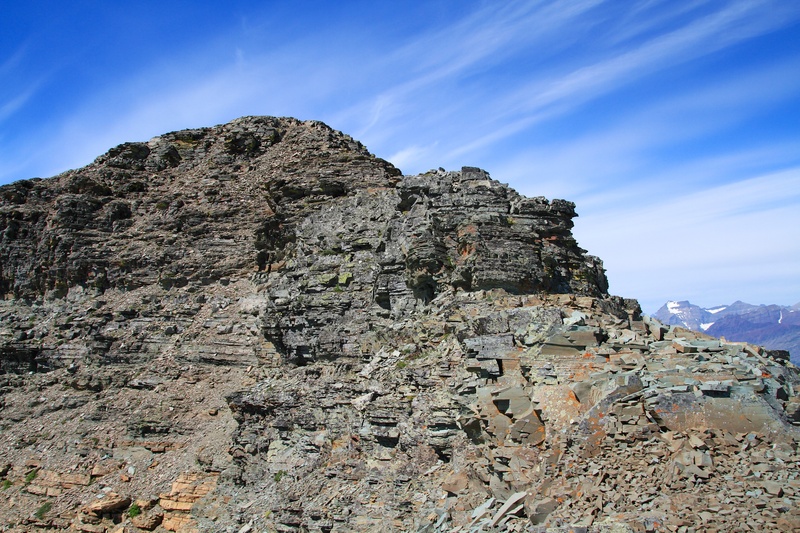 A fun, but brief walk to the summit along a ridge of stunning green argillite. 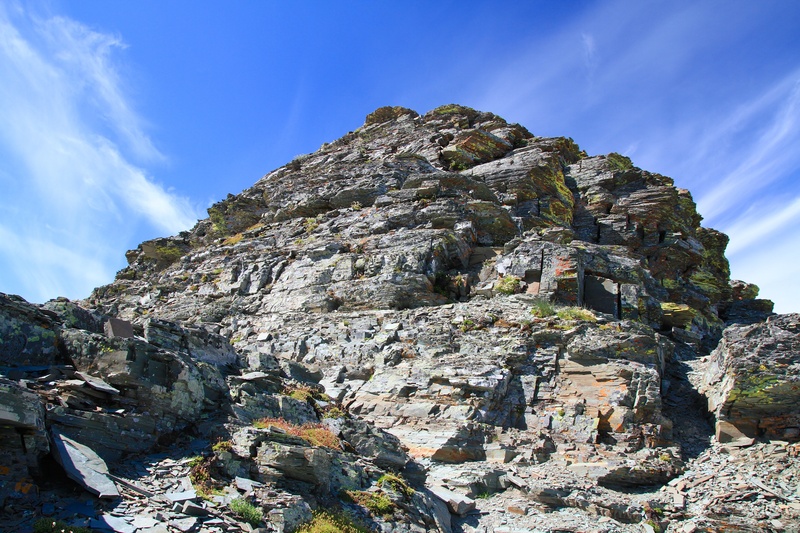 It is a short scramble up the summit block. 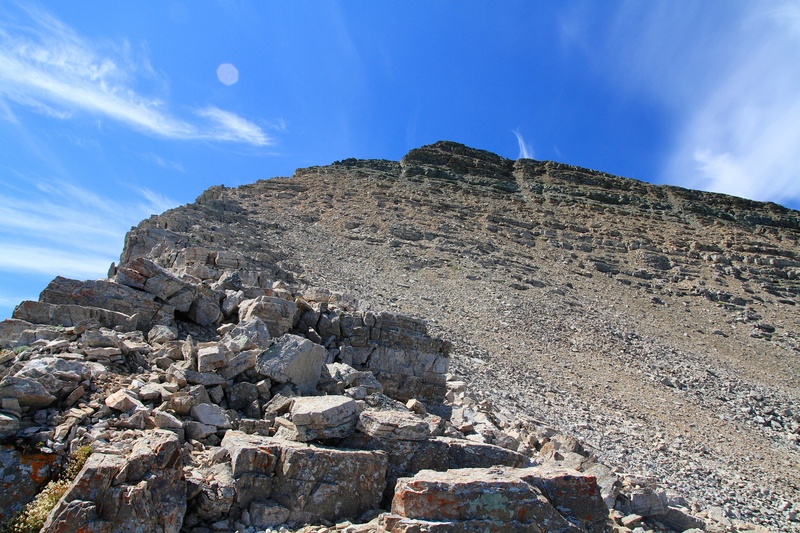 The summit cairn of Divide Mountain Montana. 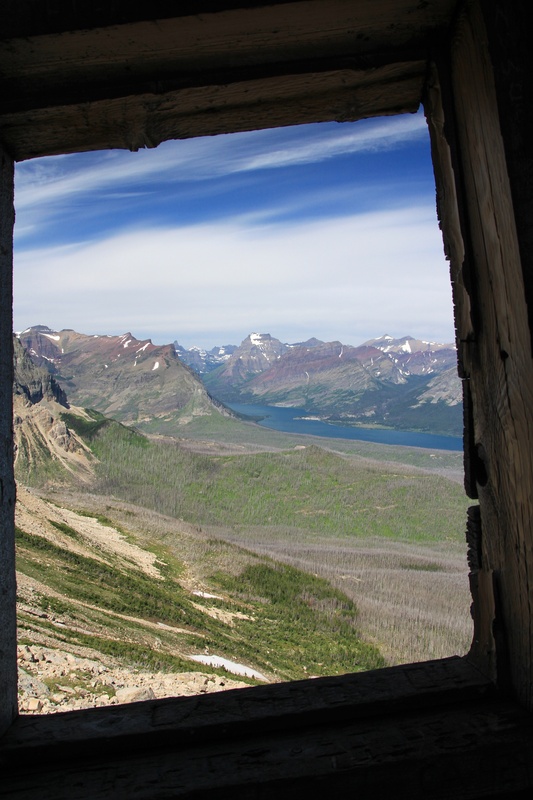 The view west and northwest into Glacier National Park. 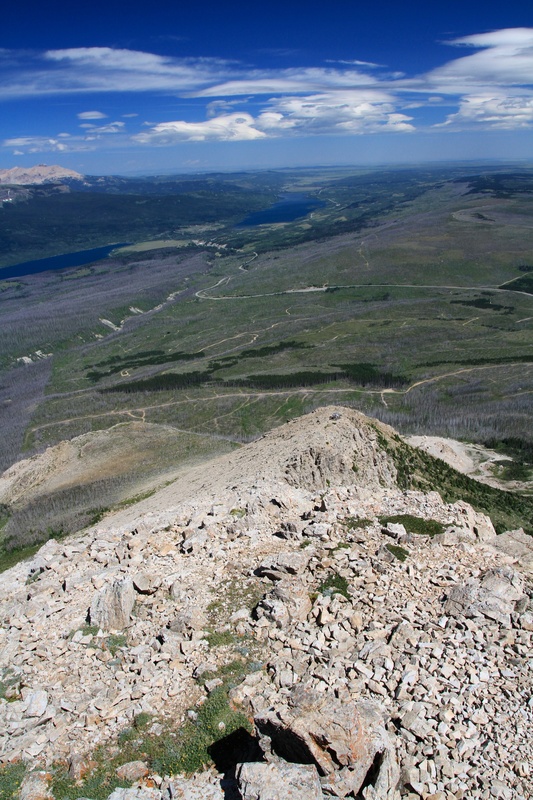 The summit of Divide is half in the Park and half out of the Park. Curly Bear Mountain is in the foreground on the left. Mount Siyeh is in the distant centre. Upper St. Mary Lake is also pictured. The impressive view to the west. White Calf Mountain is on the left, behind it is Kapunkamint Mountain. In the middle is Kakitos Mountain and Curly Bear Mountain is on the right. The view north. Going to the Sun highway and Upper and Lower St. Mary lakes are visible. Otokomi Mountain and East Flattop Mountain are in the centre. Why is it that many of the mountains in Glacier National Park are named in honour of the First Nations, while Waterton Park neglects this? 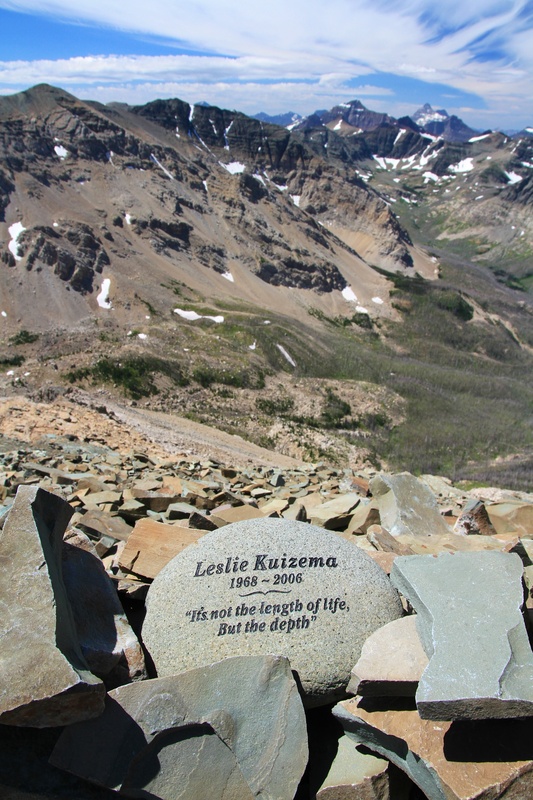 At the top is a memorial to a woman who lost her battle with lukemia. Here is the link to find out more. My first American summit and number 5 for 2013. This was also number 20 since my ‘scrambling rebirth’ in August of 2010. 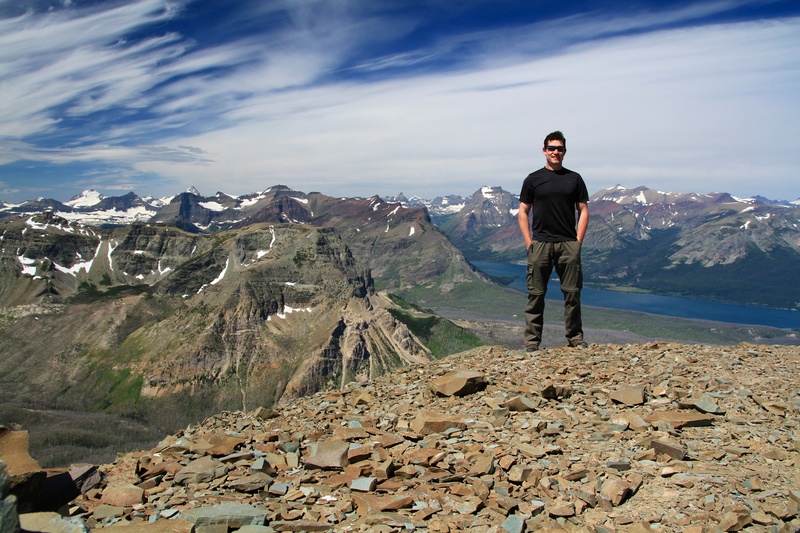 I’m actually standing in Glacier National Park in this photo as the mountain is divided in half by the park boundary – hence the name. White Calf Mountain in the foreground and Kapunkamint Mountain just behind it. Looking west again at Curly Bear Mountain and Kakitos Mountain. On the hike back to the car, I stopped at the lookout to chat with a friendly Blackfeet couple who were relaxing in the shade and enjoying the view. Earl showed me where his family has lived ‘since the beginning of time’ and we chatted for several minutes. I felt honoured to be a guest on his traditional land and I thanked him for the privilege of visiting. One last look to the west and Curly Bear Mountain from inside the lookout. A forest fire had raged through the valley several years ago and the white and black trees made for an interesting landscape. Divide Mountain was a fun morning and I was back in Lethbridge by the early afternoon. I will definitely return to hike more mountains in Glacier National Park.